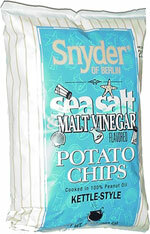 Taste test: These are good, crunchy vinegar chips with a distinctive flavor and a serious amount of vinegar. The "malt vinegar" difference was clearly noticeable in the taste. The legions of vinegar chip fans frequenting the chip bowl were impressed with the flavor and crunch of these, and the impressive zing of the vinegar shocked and awed our tasters. Smell test: Very, very strong vinegar aroma. Really gives you a jolt when you take a whiff of the bag!